Commercial space travel is well and truly moving into the mainstream – and Sky and Space Global (ASX:SAS) is one of the few ASX-listed plays, maybe the only one, with exposure to the...space. 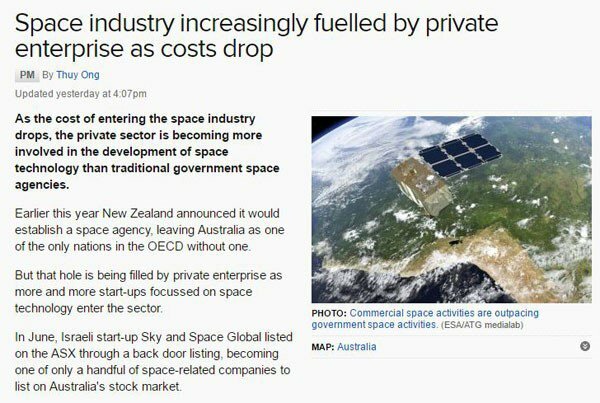 According to a recent report from Asia Pacific Aerospace Consultants, commercial space activity now comprises 76% of the total global space economy. Ventures such as Space X and Virgin Galactic have captured the imagination and right now space is shaping as the next gold rush for ambitious companies where the savvy players are getting in early. SAS is one such player. If there’s a theme emanating from this play in the past couple of months, it is validation. This is in part due to the pace that it is achieving its value creation milestones. As you can see by the timetable below, things are ticking along nicely and SAS will start constructing its nano-satellites (known as three diamonds) as early as next month. It also has several catalysts on the way including the tender (October 2016) to build a constellation of 200 nano-sats for 2018, start space simulation testing in December 2016 and launch the 3 diamonds from India in April/May 2017. Let’s not forget SAS has already secured a launch contract for Q2 2017 to be delivered through leading European launch broker, Innovation Space Logistics BV. We should warn that this does remain an early-stage tech play and all the risks inherent in that are apparent here. Apply caution and seek professional financial advice when deciding whether or not to invest in SAS. You can read more background on SAS in our previous two articles SAS Set for Take Off with Virgin Galactic Along for the Ride and Ready to launch: ASX Stock Set for Blast Off , but in this article we’ll be taking you through some of the more recent progress made by the company as it positions to become a leading player in the telecommunications space. Before we do that, here’s a video that gives you the 101 on SAS for those of you who are new to the story. 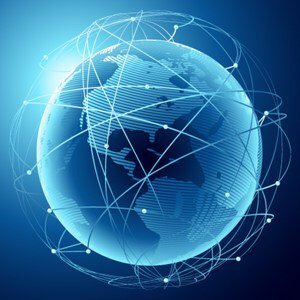 What SAS essentially wants to do is launch three nano-satellites or diamonds into orbit which will allow it to run a network (data, voice) covering equatorial nations. Big companies usually focus on first-world countries, which unfortunately precludes those living near the equator without a reliable satellite telecommunications service. It wants to launch the satellites in mid-2017 at a sum of $3M. Longer-term, it hopes to launch as many as 200 satellites into orbit, on board dedicated Virgin Galactic Launcher One flights into orbit . 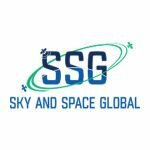 SAS has signed a Letter of Intent with Virgin galactic to be a future launch provider, using Virgin’s orbital launch vehicle, Launcher One beginning in Q2 2018 to launch their first batch of their 200 nano-sats for the Equartorial constellation. SAS has even bagged a binding prelaunch offtake agreement with a telecommunications company in Africa , and are working on more, with details of further agreements to follow shortly. 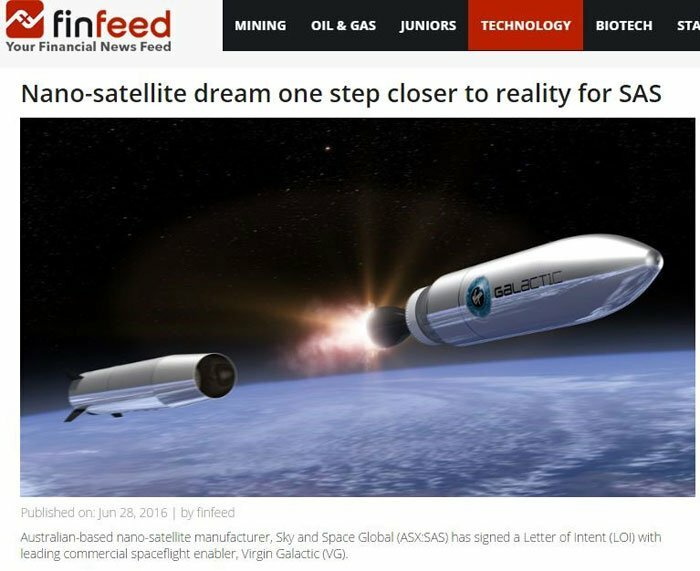 In fact, SAS has previously said that in the case of the first 100 satellite launched, that it may be able to book revenue of between $US300 million ($A390.4 million) and $US500 million. The full 200 once in Equatorial orbit by 2020 could bring in up to $1Bn in annual revenues . One of the big themes rolling around at the moment is the increasing commercialisation of space – we’re talking all sorts of things from satellites to asteroid mining. Some is theoretical, but some is very real and questions need to be answered now before the whole thing gets out of hand. It happens with any sort of commercial rush – whether that be the gold rush in Victoria which literally led to a small-scale revolution or the impending space rush. The terms of the game need to be set now – so everybody’s fascinated by the debate. It’s a juicy topic, and one that the media is starting to pick up on – and SAS is getting its name out there. With no disrespect to the ABC, we’re more excited by mentions from the trade press. In mid-August the company was invited to 2 major events: a conference put together by Satellite Finance and the Space Technology and Investment Forum in San Francisco. These are some of the biggest and most respected conferences in the world, so to be invited means that SAS is definitely on the radar of those in the industry who matter most. SatelliteFinance and the Space Investment and Technology Forum provides exclusive perspective and information on the critical business issues impacting the commercial satellite industry; from operators through to antenna and satellite manufacturers, launch providers, insurers, and investors. Space Investment and Technology Forum and SatelliteFinance subscribers include chief financial officers, heads of corporate development, investment bankers, lawyers, consultants, and capital providers who rely on SatelliteFinance for insights on the critical financial and strategic aspects of the industry. This means that the serious players in the game have their eyes on Space Investment and Technology Forum and Satellite Finance . We’re not sure if the appearance at the conference is paid or not, but in any case, Space Investment and Technology Forum and Satellite Finance isn’t going to risk its reputation in the space by inviting a sub-par player to present. Following the Space Investment and Technology Forumand the Satellite Finance conference, SAS head to France to present at the biggest event on the satellite calendar: The World Satellite Business Week which takes place every year in September and brings together almost eight hundred of the most influential representatives of the global satellite communications and information business. Featuring high profile speakers including Presidents, CEOs, CFOs or senior government officials the summit will host thematic round table discussions, presentations and a packed social program offering unique networking opportunities and invaluable insight into the current and future prospects for the industry, particularly critical at this time of turbulent economic and political environments. Towards the middle of July SAS started to register its business with the International Telecommunications Union (ITU) for a specific spectrum frequency for its satellites. Well, the ITU is an agency run out of the United Nations which coordinates all the spectrum for all the satellites in the world to make sure things are running smoothly. Investors should note that ITU certification is not guaranteed though, and this shouldn’t be factored into any investment decision. In fact, you should always consult a professional and do your own research before deciding whether or not to invest. Finally, SAS is covered just in case everything goes wrong... As it turns out, launching satellites into space can be a bit...risky. Luckily, SAS was able to bag insurance for the launch of its 3 Diamond nano-satellites from Brit Global Security at the end of June. This means the whole $3M of working capital invested is covered, for only a small premium. Now, this isn’t like getting home and contents insurance. This is a touch more...complicated. It’s not that there’s a likelihood that the satellites won’t launch, but it’s just rather specific insurance to obtain. If you have a vintage car, you know how hard it is find comprehensive insurance. As it turns out, SAS could pick and choose their insurer after it put together an open tender for the insuring. It also managed to bag a “favourable rate”, due to high technology competence and confidence level that the likelihood that anything would go wrong during launch is extremely low. So, more than likely the insurance won’t be needed – but isn’t it the case with most insurance? Better to have than not – and the “favourable rate” combined with the fact SAS had multiple bidders, each doing his own homework and DD before submitting a proposal to provide the insurance is a massive vindication of SAS’ prospects. It was a great piece of validation for the company, after all, if it were a risky proposition it would either pay through the nose or no insurer would touch it. As we said up top, the past two months have been all about validation for SAS. Whether it’s come from regulators, insurers, or the press, SAS is starting to be seen as a very serious player in the game. With deals with Virgin Galactic and GomSpace in the bag and a launch date set, SAS is on schedule to meet its milestones and change the way communications services are delivered to third world nations. The question remains as to how far into orbit this small company can go. It may just be time to take out the telescope and have a look.